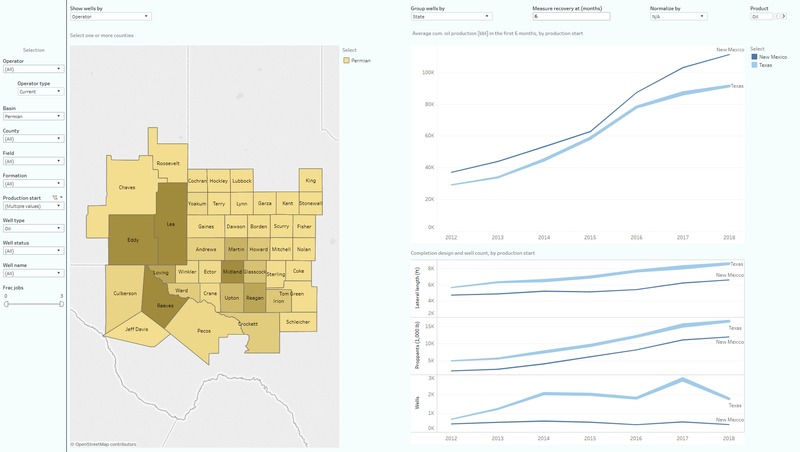 These interactive presentations contain the latest oil & gas production data from all 18,480 horizontal wells in the Permian (Texas & New Mexico) that started producing since 2008/2009, through October. Oil production in the Permian kept rising at a rate of ~1 million bo/d y-o-y through October. I expect that after revisions total output topped 3 million bo/d. 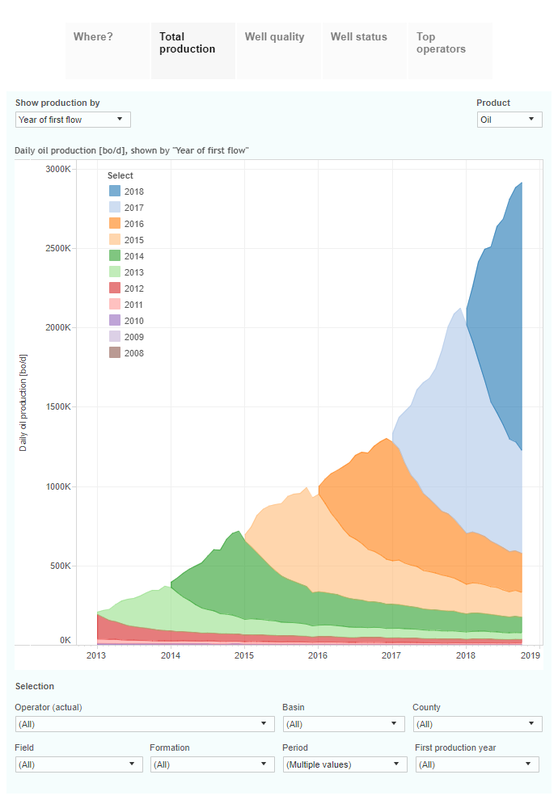 That also means that almost 60% of October oil production came from wells that started in 2018, as is visualized in the graph above. Gas production has seen a very similar growth path, and is now over 9 Bcf/d (switch ‘Product’ to gas to see this). Despite increased completion activity, well productivity has still slightly increased since 2016, as you’ll find in the ‘Well quality’ tab. Recent wells are on a path to recover on average around 200 thousand barrels of oil in the first 2 years on production. Important factors behind this increase in well performance are longer laterals, and bigger frac jobs. 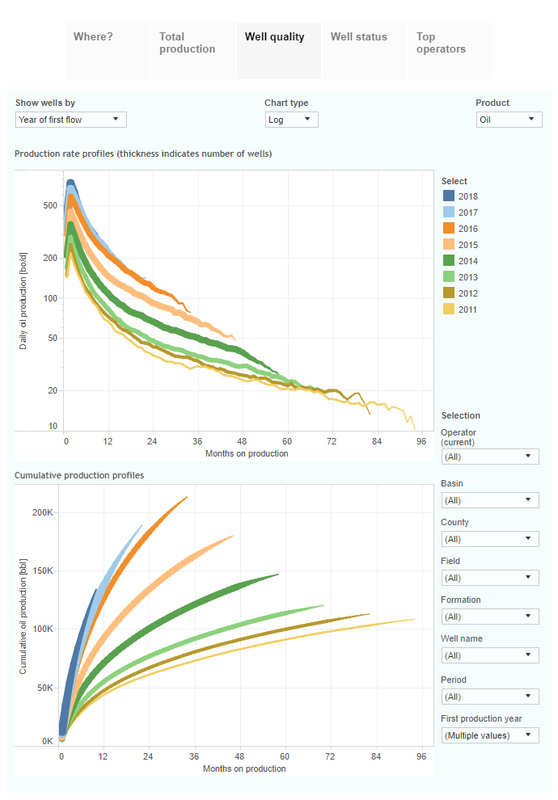 The following screenshot, from our ShaleProfile Analytics service, shows that average cumulative oil production in the six months rose on both sides of the state border since 2012. Interestingly, results are on average better in New Mexico, even though laterals are shorter and proppant loadings are smaller. The final tab shows that all 5 leading operators have roughly tripled their output in the past 3 years. 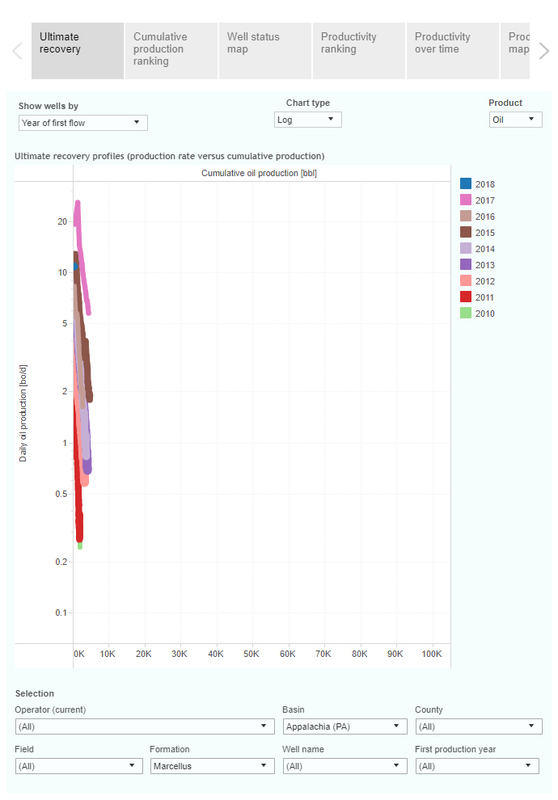 This “Ultimate recovery” overview shows the average production rate for these wells, plotted against their cumulative recovery. Wells are grouped by the quarter in which production started. Initial well productivity has kept rising through the last quarters. The more than 1,000 wells that started in Q3 last year peaked over 800 bo/d in their first full calendar month. The performance is shown of all the horizontal oil wells in the Permian, that started production between 2011 and 2014. Only wells are selected that fell below a production rate of 60 bo/d not later than May 2016 (this ensures that we have at least 30 months of data for all wells), from which they never recovered. There were 3,183 such wells, from in total 6,065 horizontal oil wells that started in the Permian in these 4 years. The top chart shows the oil production rate (logarithmic scale) of these wells, by the number of months since they fell below 60 bo/d. The wells are grouped by the year in which they started. 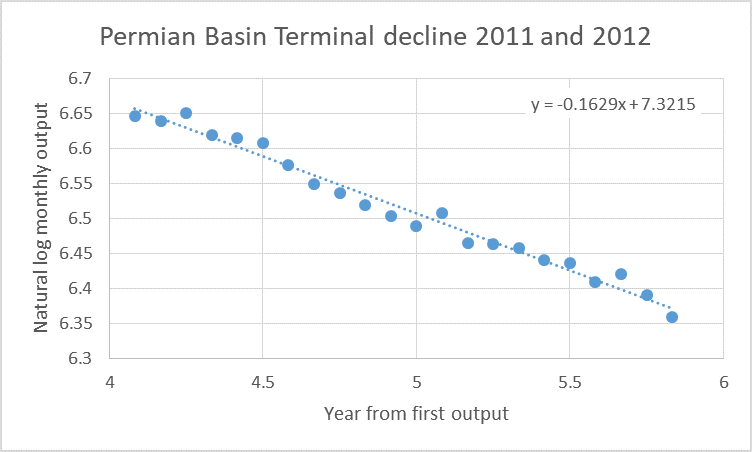 The bottom chart shows the average annual decline, calculated based on the plot above. If you have also seen the previous 2 posts, you’ll note that terminal decline rates are lower here than in the DJ Basin & the Eagle Ford. The decline rates drop to a level between 15 and 25%, before they stabilize or start to increase again. As noted above, data after 30 months is not complete (not all wells have more historical data). Also here you’ll see that younger wells experience larger decline rates. Again I would like to emphasize that part of that is expected, as they earlier in their hyperbolic decline curve, where decline rates are naturally higher. But it still appears that even if you correct for that, younger wells decline faster. Likely there are several effects in play, such as changing economic limits & completion designs and more infill drilling. As more and more wells enter this phase, this could increase the decline rate of the whole population (e.g. a certain vintage), negatively impacting EURs and reserves. If you have any thoughts on this topic, please share them below in the comments section. Next week we are at the NAPE summit in Houston, so if you happen to be there, please come visit our booth (#2331). We still have time available earlier in the week for 1-on-1 meetings in Houston, so please contact us if you’re interested in understanding how we might help you. Early next week we will have a post on all 10 covered states in the US. We also plan to launch a new (cheaper!) version of our Analytics service then. Production data is subject to revisions. Note that a significant portion of production in the Permian comes from vertical wells and/or wells that started production before 2008, which are excluded from these presentations. Texas RRC. Oil production is estimated for individual wells, based on a number of sources, such as lease & pending production data, well completion & inactivity reports, regular well tests and oil proration data. OCD in New Mexico. Individual well production data is provided.